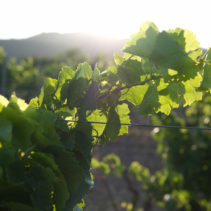 All of the wines of the domain are ‘Bio’ wines made using ‘Bio-Dynamic’ culture. In 1924, Rudolf Steiner (Vienna School of Engineering) noticed stress and boredom in the cities. He linked this phenomenon to bad quality food. As a result of this observation, over a period of time and eight conferences, he defined this new agriculture to interested farmers. These conferences are available in the ‘Lesson to farmers’ by Rudolf Steiner. Ploughing and weeding the soil. 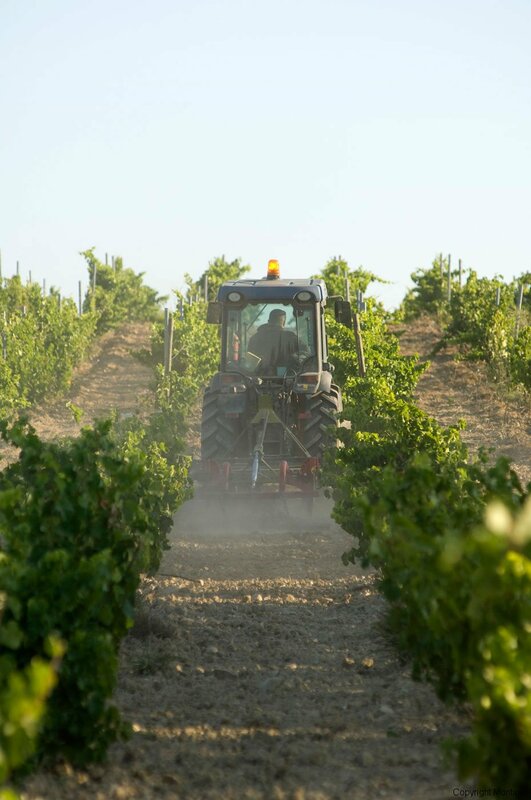 To be precise, the bio-dynamic preparations help the vines to find balance so as, on the one hand to adapt to the climate and its hazards, and on the other hand to resist disease. They favor the exchange between soil and the root systems of the vines so as to allow the expression of the land in the grapes. Bio-Dynamic preparations favor life; they come from vegetable, animal and mineral matter which have been transformed. 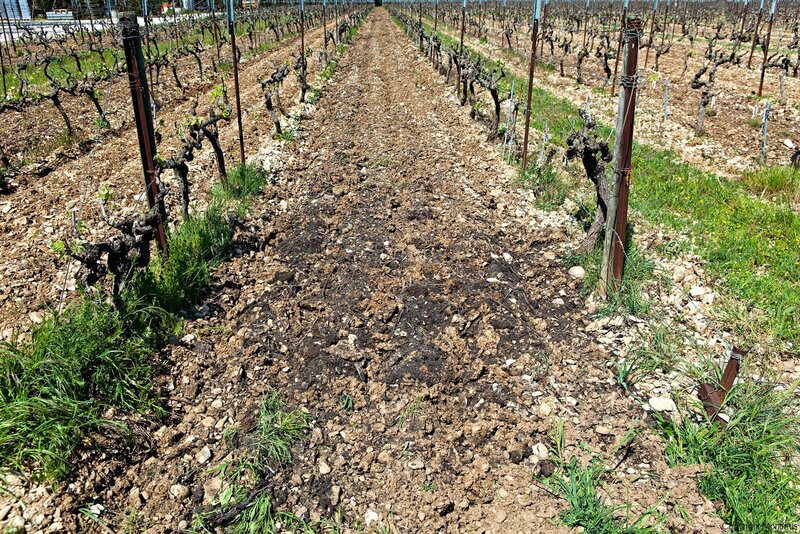 The aim is to improve the exchange between soil, root and vine to allow full expression of the land in the grapes. Preparation 500 (horn manure) has an effect on the plant. It reinforces underground life. Its efficiency is confirmed by numerous observations: the roots are longer, denser and better spread out. Preparation 501 (horn silica) helps the growth of the leaves, the balance of the flowers, the floral initiation for the next year. It gives the necessary energy for good fructification. The 501 preparation brings light. So, it must be spread in spring, early in the morning to avoid foliage or flower burn. 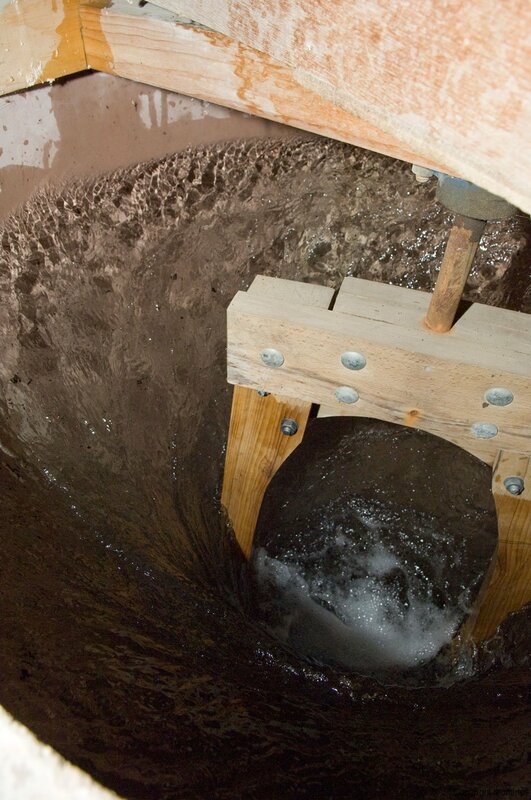 The Maria Thun cow dung preparation is a compost of cow dung which reinforces the process of decomposition of the earth. It contains all the elements which help in the formation of a clay-humus complex. Many micro-organisms are found in it which favor the life of the soil. These preparations must be dynamised. 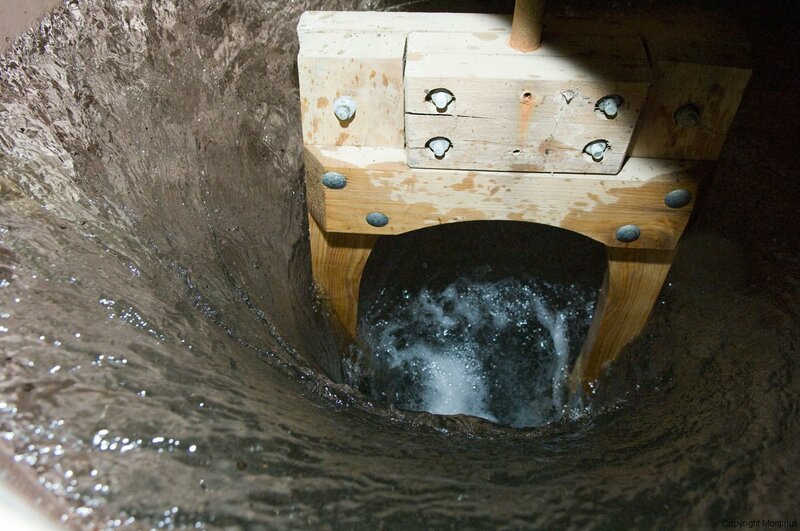 They are diluted with water in an open vat of 400 litres or in a cement vat (invented by Francois Bouchet) of 1.000 litres. 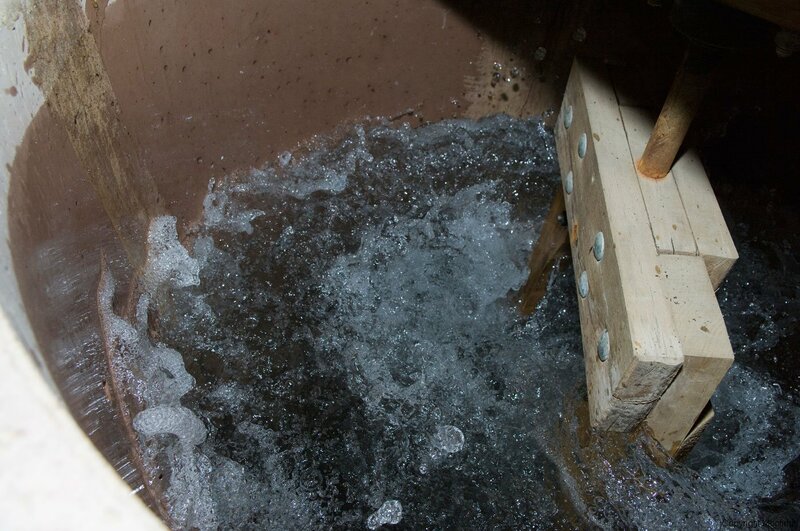 The water is stirred until a vortex appears towards the bottom of the tank. Therefore this rotating movement is called dynamisation. We then reverse the movement until it bubbles in the opposite direction. We do this operation for 20 minutes or 1 hour depending on the preparations. Other preparations are made of Achilles, Camomile, Nettle, Oak bark, Dandelion and Valerian. All are fermented to be transformed into humus with particular qualities. They will be used to seed compost so as to transmit the influence of the 7 planets of our solar system. Our ancestors did the same with the 7 year rotation of crops. Thanks to this calendar, work and treatment in the vines can be improved by the appropriate choice of dates. 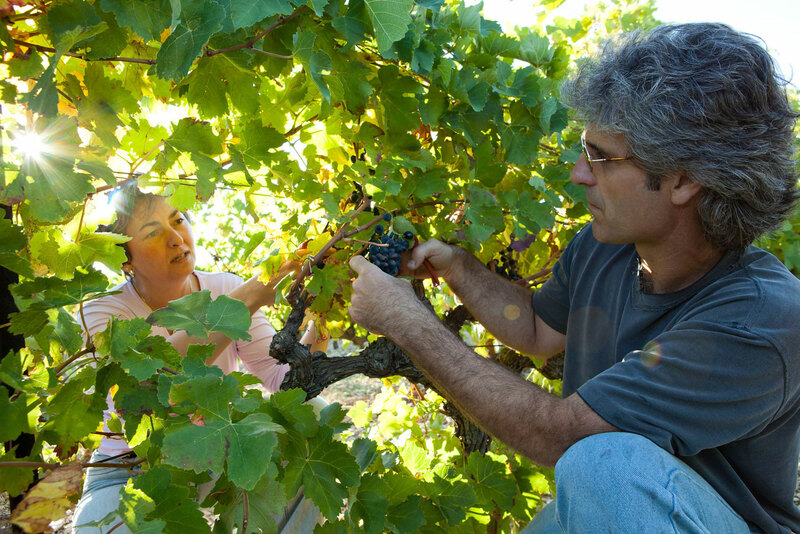 For us winemakers, the fruit days are the most important. The earth is alive! It possesses an extraordinary living structure: billions of living organisms per gram. (cf. Claude Bourguignon Eng. Ag.). In fact the fauna (worms, bacteria, micro-organisms) create a natural airing and porosity in the soil, which allows it to better absorb rainwater and limits erosion. This fauna also transforms organic matter into humus. We also know that the exchange between the soil and the roots does not happen directly but with the help of these micro-organisms called mycorrhizae. So, without life in the soil, there cannot be the expression of the land. By airing and lifting the soil, we improve the activity of the earth, because the sub-soil fauna (to a depth of 30 centimeters) is exclusively aerobic. 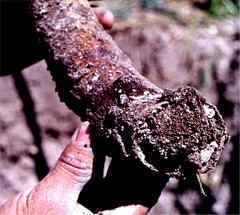 This type of cultivation cuts the surface rootlets of the plants which incites the main roots to plunge deeper into the earth to look for nutrition. We use a tool called a ‘griffon’ (a weeder) pulled by a tractor (Photo). 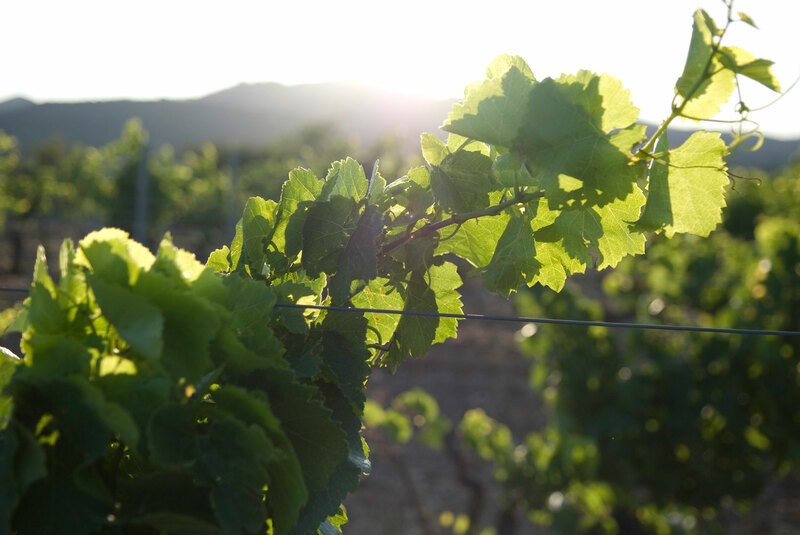 Scientific studies show that Bio-Dynamic culture has a real impact on the cellular composition of the grape skin. The photos here are from a study done on the 22nd July 2002 on grape bunches of Châteauneuf-du-Pape. 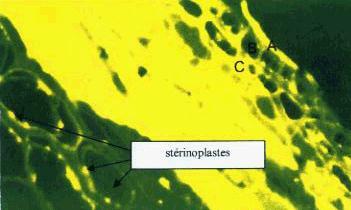 The cytological examination reveals a perfect structural organization in the Bio-Dynamically cultured grape. The cuticle is regular; the epidermal layers are rich in phenols. The defense structures of the grape are in place. 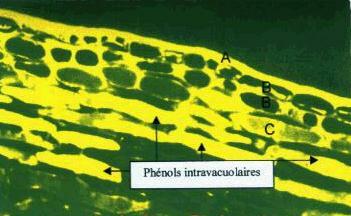 The vacuoles (minute cells) are rich in phenols. In fact their function is to assure a defensive role against exterior aggression. The tannins are coloured yellow. 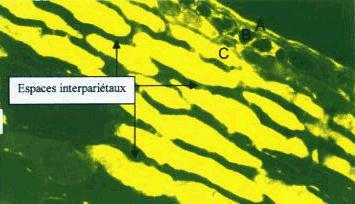 Scientific work done by S.Gallet, M. Abert, P.O. Coulomb & P.J. Coulomb. Work financed by the International Syndicate of Bio-dynamic winegrowers.